Selling a super yacht is a time consuming process. 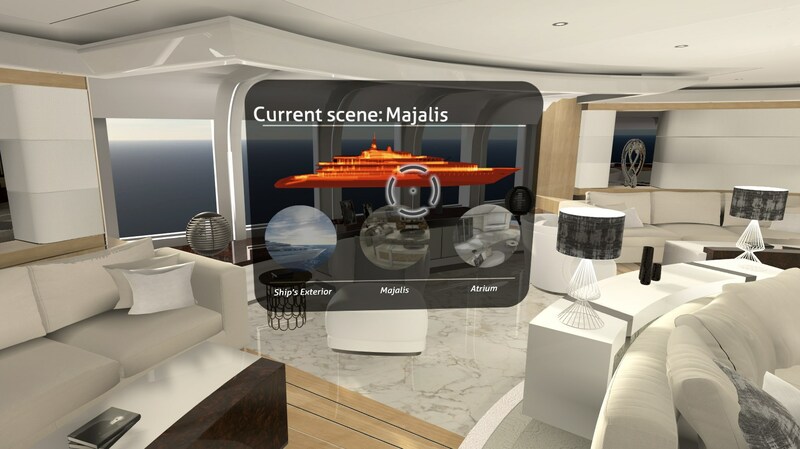 By building a portable virtual reality solution we provide the brokers from YPI a new tool to convince potential clients in investing in new-build yachts. Potential clients for a super yacht aren’t there for the taking and they have a very busy schedule. Brokers only get a few changes to convince a potential client for investing in a new-build yacht. Selling a yacht on a brochure is still the conventional way, YPI sees this as an opportunity to differentiate from the market by creating a new marketing tool for selling super yachts and providing clients with an experience that resonates with the feeling of walking on a super yacht. “How can we bring the mountain to the client instead of the client to the mountain?”. Our developers worked hand in hand with the architects from the RAPTOR project to build three scenes for the user to walk through. We used the UNITY engine, the Oculus Rift and a custom-made PC to deliver a stable 75fps virtual reality experience. Next to that we developed a prototype Hardcase box for the PC that is strong enough to travel the world by car, ship or plane. With this box the brokers are able to take their experience to potential clients and show them the possibilities of building their dream yacht. We choose to create a work method with the designers to convert the drawing to our UNITY engine. 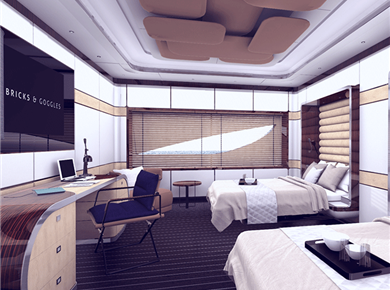 The designers from McFarlane Shipdesign and H2 Yacht design delivers us the models from different CAD programs like 3DSmax for the interior and RHINO for the exterior. By streamlining the proces of the delivery of the CAD files we managed to build an efficient work method of converting CAD files to virtual reality. Next to that we developed a brand new user interface for the user to navigate through the yacht. 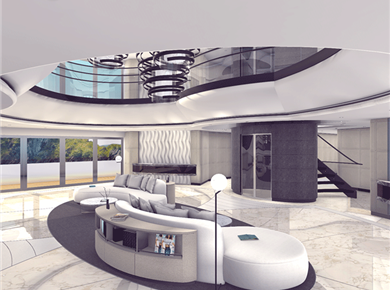 We placed different scenes of the ships most beautiful rooms in a UI and by pointing the crosshairs on the scene of choice the user can switch through the rooms of the yacht. To provide the user a feeling of control we developed an option to change materials of the furniture. Together with the option to move freely through the model the user can see what his furniture choices do with a room. Together with Russell Crump (head of sales YPI) and Terry Allen (head of engineering McFarlane Ship design) we give the demo a ride on the METS show in Amsterdam in 2015. The results where beyond expectations, influencers of the market lined up at the booth to see the model. The model has to be completed with 6 more rooms before it official launches in 2016. Protagoras Holding B.V. © 2018. All rights Reserved.